First of all, I need to officially show what I did with "A Hot Mess" - colorful. I made the top back when it was so hot and muggy that I couldn't bear to even think - much less piece accurately. I had found a plastic bin filled with a lot of orphan blocks and pieces. I knew I had already started the A Hot Mess colorful, but it was quite small at that point. Then, I came up with so many pieces of blocks or finished single blocks that I wanted to go ahead and use them. It made it very fast to put this together. My sis said it is a hideous top - the ugliest I have ever made! So I began to play around with the idea of making a star out of it - using a solid fabric to sort of create a point of focus on it. This is what I drew on it. But after some thinking and asking our Facebook group if I should do the star or not, the overwhelming majority said leave it as it is - quilt it - so I will. I promised to do whatever got the most votes. It's not as if this is a right/wrong issue! It didn't really matter to me. So a quilt it will become. I'll square it up after I get it quilted. 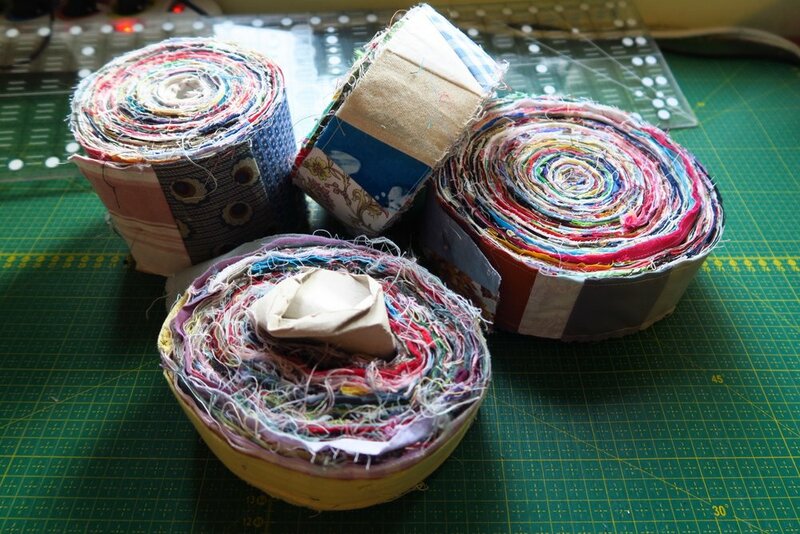 This week I pulled out my pieces that are sewn to paper tape and while I don't have any great ideas yet, I'm going to leave them in a prominent position so I can come up with an idea. I need to use them. I've had them sitting on a shelf for a couple of years now! It's past time to put them to use! I'm not sure what to do yet. I've made a few quilts using these. 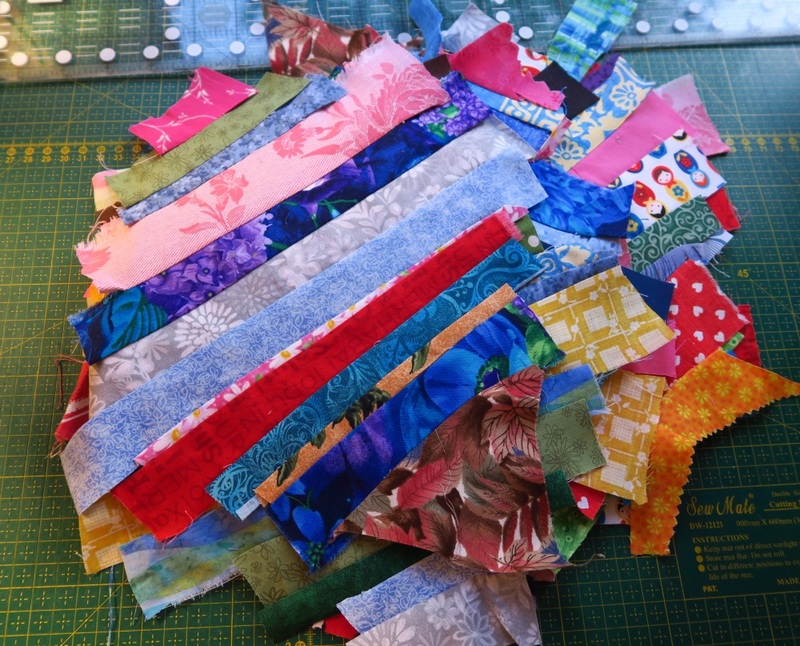 As a point of review, here are the quilts I've made using this adding machine tape;. Then, I got started on my next strings quilt. The strings quilt tops are going much faster than crumbs tops. That may be because my strings are a bit bigger than some people use, AND because my designs have a lot of negative space. But that space is needed for me to like it! Here is the plan - the one that doesn't show the blocks. It's simple but should be effective! I'll use white as the neutral background. I'm going to go smaller with the blocks, though, using 6" instead of 8.5" like I used in Please be Seated. I'll need a lot of blocks for the plan I have. But because they are smaller, maybe they will be faster and I can finish more each weekend. The narrow outer border isn't really a border. That is just showing the binding. I'm going to put a white border around it and let the chevron stripes "float". All I did this week was make these 10 strings blocks - getting ready to start making them into half square triangles. I just felt like I needed to get going here so I sat down to get at least SOME done this weekend. I cut my interfacing at 7" square. I found that it works really well to use this - it keeps the quilts from being so..................very.............heavy. I went through my most recently finishes and am using those strings up first with these blocks. I've got to somehow get a handle on these! Seems like I create more than I use - even when I've been trying to focus on using them! You can go here to see where the crumbs/strings project stands at the moment. I started it just over a year ago because I wasn't using up my strings/crumbs - they were just collecting in bags. I needed to either get rid of them or at least make an attempt to start using them. When someone told me at $12/yard that 2" strip is worth $0.60, I realized I had a fortune in strings and crumbs in my bags. So I decided to challenge myself and try to make things I liked. That was the key - I had to keep working with the design until I got something I liked. Now I have 2 more ideas after this one - so I'm okay on plans for strings now! If you've gotten to the end of this post, then congrats! I've got lots going on in my head with regards to strings/crumbs right now! Cultural - How do Polish people spend their summer holidays?